If you’ve been dreaming about a career in the music industry, we’ve got good news. We’re offering a huge discount off all Point Blank Los Angeles courses over the festive period until January 9th! Enrol now and you could save up to $3,000, including our new, flagship Music Production & Sound Design Advanced Diploma. 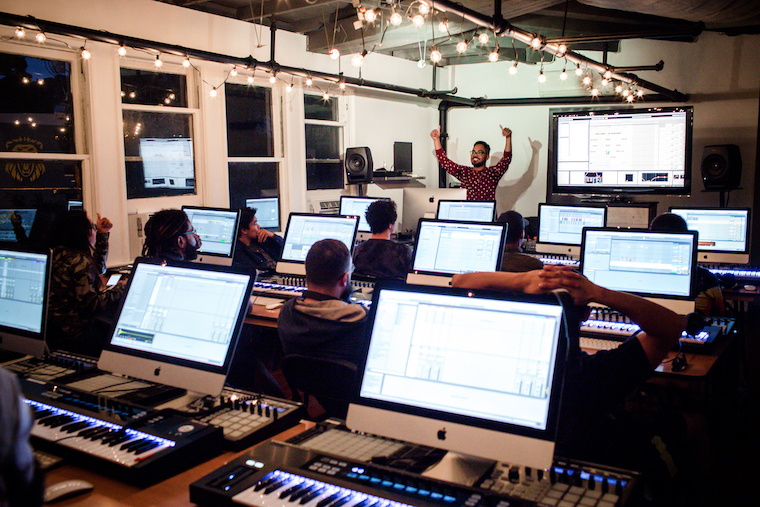 Based out of Mack Sennett Studios in Silverlake, Point Blank offers unparalleled immersive and practical education across all areas of music production and sound engineering – so what are you waiting for? To get your discount, just enter XMAS20 when you enrol. The Music Production & Sound Design Advanced Diploma is supported by Pioneer and developed by industry professionals who have worked with Pharrell Williams, Richie Hawtin, Goldie and more. It offers a comprehensive practical guide to the creative process of writing, recording, mixing and mastering your own music whilst discovering how the music industry works. You can check out our full range of LA Courses here and remember, if you want to study at Point Blank Los Angeles but work full-time or have other commitments during the day, we are now pleased to offer classes for our LA Certificate and Award courses during the evening. For further information on our degree course or any of our courses, contact our Course Advisors here or call 0207 729 488 or, if you’re in the USA, give us a call on 323 282 7660. If you’re calling internationally, use the number +44 20 7729 4884. Want to see firsthand the amazing facilities offered by Point Blank? You can book a space on one of our studio tours by heading here. Every production station at PBLA comes with NI’s Komplete Kontrol S-Series keyboard, Ableton Push, AIAIAI TMA-1 Studio Headphones and Maschine plus more – and you now have the option to study in the evening while saving a huge 20%! Want to get a taste of what it’s like to study at PBLA? Our virtual tour provides a taste of the state-of-the-art gear that you’ll be learning on and the unique, creative environment that we offer at our Mack Sennett Studio base. Take a look around now. The post Christmas Offer: 20% Discount On Los Angeles Courses Until Jan 9th – Save up to $3,000 appeared first on Point Blank’s Online Magazine.